Mr. Mohammed Edderkaoui, Global Marketing Director of UNIMER Group SA of Morocco announcing the new marketing communications strategy for Titus. 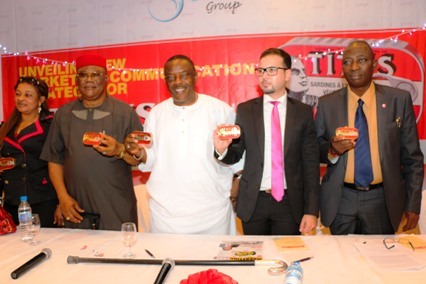 UNIMER Group SA Morocco Unveils New Marketing Communications Strategy for Titus Sardines for Nigeria and Pan-Africa Market. 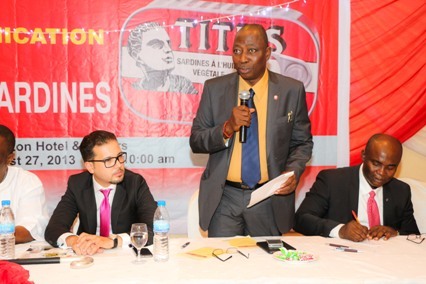 Titus Sardines brand has been in the Nigerian canned fish market for over 80 years now and the producers UNIMER Group SA of Morocco unveiled a new marketing strategy to maximize the popularity of the Titus brand in Nigeria. 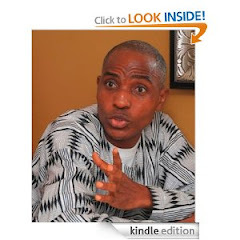 Sir Emma Bishop Okonkwo, OFR, Chairman of Ekulo Group. 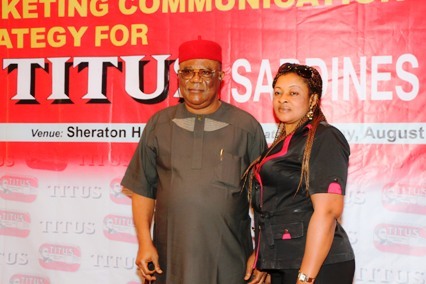 Chief and Mrs. Sylvester Obiakor, major distributors of Titus Sardines in Nigeria. 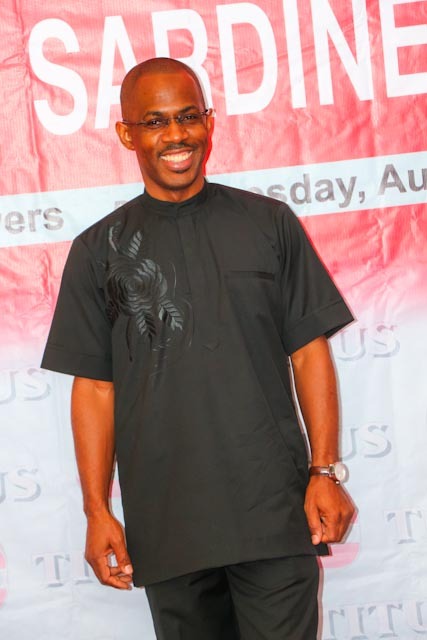 The red carpet event presented by Mohammed Edderkaoui, Global Marketing Director of UNIMER Group SA held on Tuesday 27th of August, 2013 at Lagos Sheraton Hotel & Towers in Ikeja attracted Sir. Emma Bishop Okonkwo, OFR, Chairman of the Ekulo Group, Mr. Emeka Oramadike, Marketing Manager of Ekulo Group of Companies,, Chief Sylvester Obiakor and Mrs. Obiakor, Mrs. Cicly Adanma of Reddington Hospital, Mrs. Pet Anyi Obi of Soltito Events, Mrs. Nonye Okwara, CEO of Events Gallery, Susan Eyo-Honesty, Publisher of Glam & Essence, Nollywood star Hakeem Rahman, guest performing artiste Chawa Khali, Mr. Biodun Kupoluyi, Publisher of E247 magazine, Ms. Clara Okoro, CEO of Brand World TV, Ms. Uche Akolisa, Life Editor of Business Hallmark magazine, Mr. Ingram Osigwe, MD/CEO of Fullpage International Communications Limited and other dignitaries, including all the major news media channels like Silverbird TV, Channels TV, Brand World TV, Daily Sun, Entertainment Express, Newswatch, National Mirror, The Guardian, The Nation, Ovation International magazine and others. 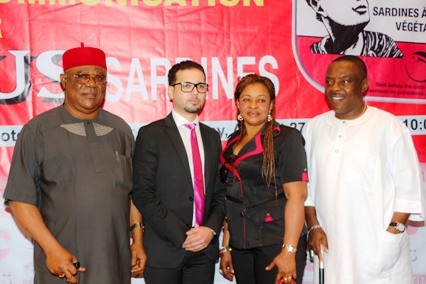 Chief Sylvester Obiakor, Mr. Mohammed Edderkoui, Mrs. Obiakor and Sir Emma Bishop Okonkwo. 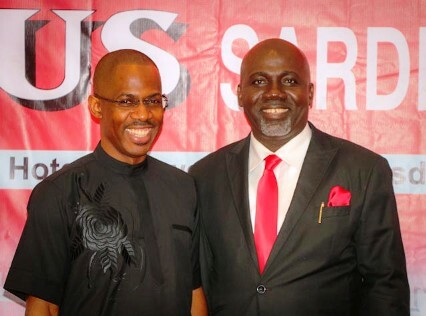 Barrister Ndubuisi Akwuegbu and Mr. Ingram Osigwe. 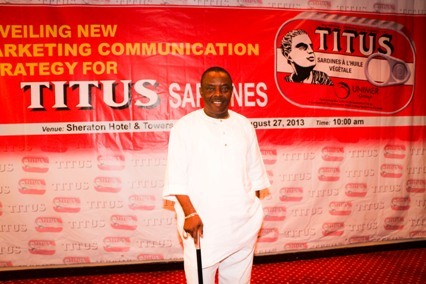 Chief Odun Fadoju, CEO of DP Partnership presenting the new marketing strategy for Titus Sardines in multimedia. The UNIMER Group SA reinforced their commitment to injecting variety into the Nigerian market to sustain consumers’ ability to make choices out of many available brands. 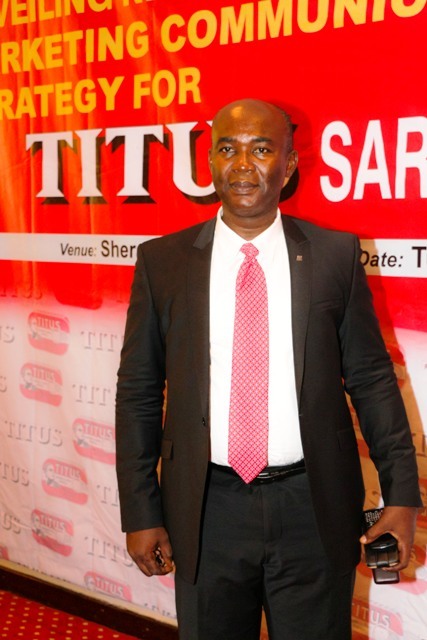 By unveiling new marketing strategies for canned Titus Sardines, the two companies are also irrevocably committed to ensuring that Nigerian consumers are provided with the best brands available all over the world. 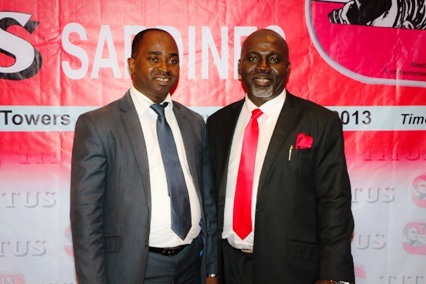 Mr. Kingsley and Mr. Gerald Opuruozor of Franchise Law and Kenneth. 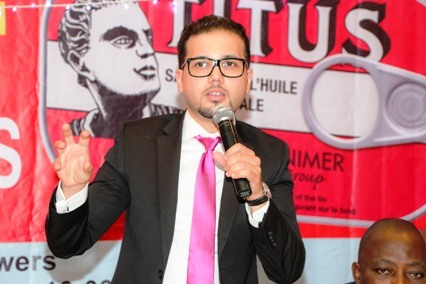 The Global Marketing Director of UNIMER Group SA, Mohammed Edderkaoui said with good business partners like Ekulo and other major distributors, Nigerians are assured of constant supply of premium Titus Sardines brand. Edderkaoui explained that canned Titus Sardines have huge brand integrity established in almost hundred years and also available all over the world. 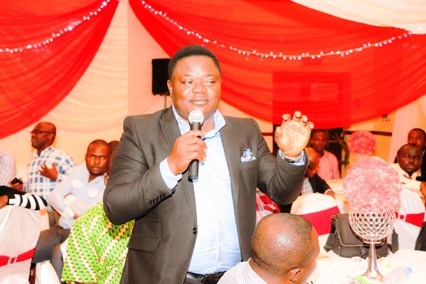 To ensure that the brand is etched permanently on the consciousness of consumers, DP partnership and Draft FCB Africa Ltd, one of Nigeria’s major players in the advertising industry has the mandate of the brand owners to create world class marketing strategies to drive Titus Sardines. Essentially, the new strategy for marketing Titus canned Sardines is being driven by comprehensive holistic platforms, including television commercials, radio jingles, outdoor, social media advertising among others. 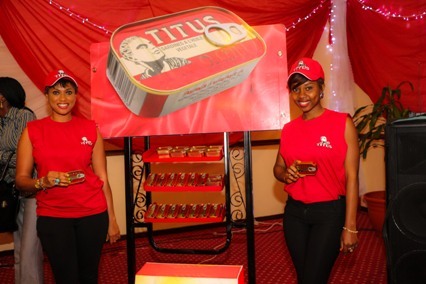 Titus is a premium brand of Sardines which has been trusted for generations all over the world. It enjoys the pedigree of being around for over 80 years and is known for its high quality, great taste, aroma and nutritional values. It is rich in Protein, Vitamin D, Vitamin B12 and contains heart-friendly oils. Titus canned Sardines can also be used with bread as sandwich and also comes in handy in preparing small chops such as fish rolls. It is also excellent for rice, spaghetti, yam and host other dishes to which it adds great taste and flavour..
Mrs. Cicly Adanma and Mrs. Pet Anyi Obi. Princess Tupee Iyase and a guest. 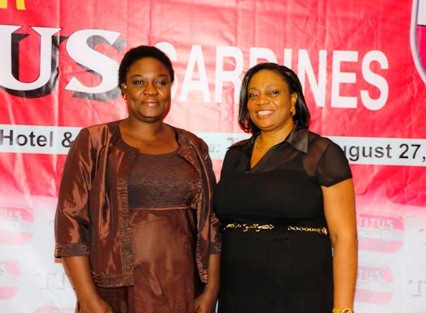 Mrs. Pet Anyi Obi and Mrs. Nonye Okwara. Mrs. Pet Anyi Obi, Mr. Ingram Osigwe and Mrs. Nonye Okwara. Mr. Ingram Osigwe and Dr. Obiefuna Okoli. 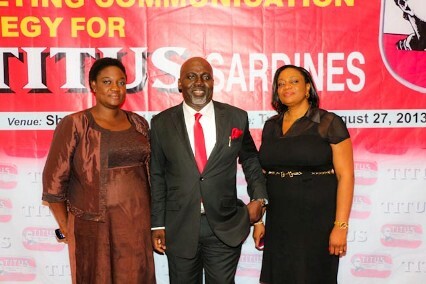 Hostesses Akunna and Ugochi pose with the Titus Sardines. Chawa Khalik and his two female dancers performing at the event. 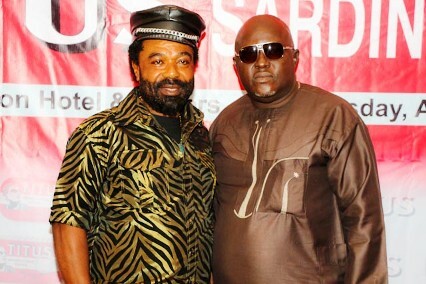 Nollywood star Hakeem Rahman and Chawa Khalik. 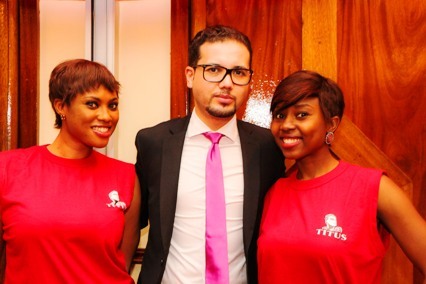 Mr. Mohammed Edderkaoui and hostesses Akunna and Ugochi. 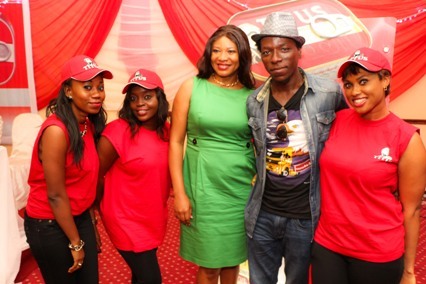 Ms. Clara Okoro posing with hostesses and a photographer. 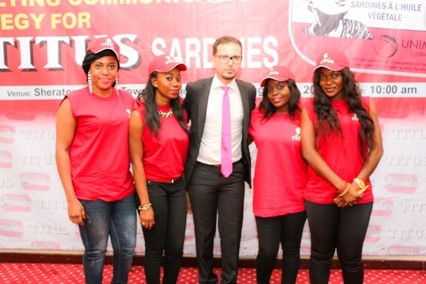 Mr. Mohammed Edderkaoui and hostesses. Mr. Oparaji Chukwunonso of Kre80graphik Services, Events Photographer. 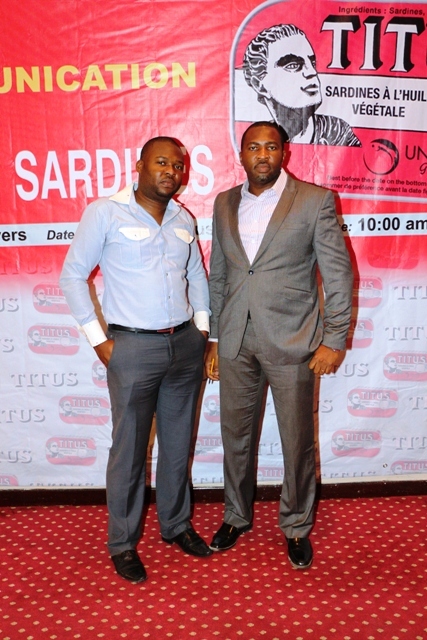 Titus Sardines represent an invaluable source of fish protein and will go a long way in helping to balance the nutrition need of Nigerians. The Food and Agricultural Organisation (FAO) some years back estimated that animal protein consumption of Nigerians was only two percent of the recommended level. Canned Titus Sardines are rich in fish protein with many advantages over meat and other sources. This is largely because, according to the FAO, fishes are more affordable, more digestible and nutritious. T itus Sardines contain more Lysine and essential Amino Acids than meat and are devoid of Cholesterol. Protein from Titus canned Sardines is 70 percent assimilated through the human alimentary Channel, compared to less than 15 percent of meat and less than 10 percent for vegetable proteins. Researchers are of the view that regular consumption of Titus canned Sardines may reduce the risk of diseases ranging from childhood asthma to prostate cancer. 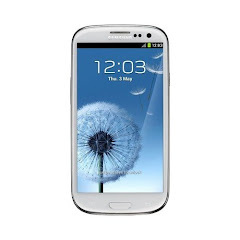 The product is low in fat, high in protein and an excellent source of Omega 3 fatty acids. In fact the Omega 3 fatty acids in Titus canned Sardines may reduce the risk of many types of cancers by 30 to 50 percent, especially of the oral cavity, esophagus, colon, breast and ovary. Health and nutrition experts also credit canned Titus Sardines with efficacy in reducing the risk of heart diseases and stroke by reducing blood clots and inflammation, improving blood vessel elasticity, lowering blood pressure, lowering blood fats and boosting good cholesterol. Breast feeding and expectant mothers who develop the habit of consuming canned Titus Sardines reap the benefit in the mould of giving birth to babies with bright eyesight. In the case of pregnant women, experts say intake of canned Titus Sardines hugely helps reducing the risk of having premature babies. ... Life is better with TITUS! 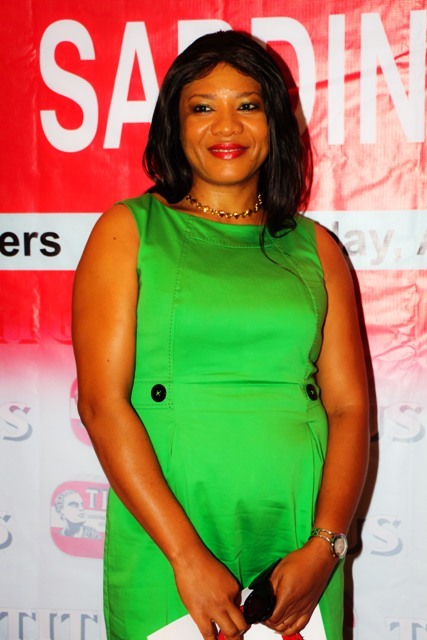 MD/CEO, Fullpage International Communications Limited. LONDON, August 29th, 2013 /PRNewswire/ — With an array of fashionable swimwear in the season’s hottest prints and designs, Swimwear365 has a reputation for providing some of the hottest beach and swimwear around. 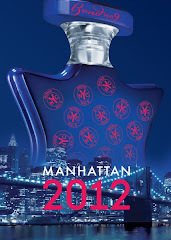 It’s loved by everyone, including celebrities and those with insider knowledge. Swimwear365 have teamed up with TOWIE co-star and Bikini-lover Lucy Mecklenburgh. After being voted best bikini body of 2013, beating out superstar rivals Rihanna, Beyoncé and Khloe Kardashian, the reality television star was snapped wearing one of Swimwear365’s bikinis whilst vacationing in Majorca. Lucy is now working alongside the brand, giving her opinion on what she loves from the collection of swimwear available online, highlighting her favourite pieces; so you can look amazing at the beach and poolside. The stunning collection includes uber stylish bikinis, tankinis, swimsuits and swim dresses in a whole host of different styles and patterns, ranging from floral to block colours and monochromes. 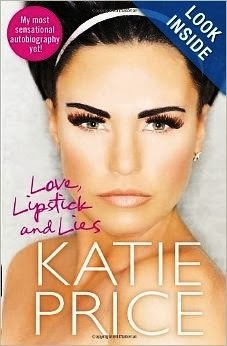 You can also follow what ‘Lucy Loves’ on Pinterest, which is filled with the latest swimwear the TOWIE star finds simply irresistible. 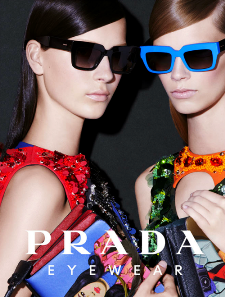 Swimwear365 showcases the knowledge of fashion stylist Helen Boyle – of This Morning fame. Helen has worked within the fashion world for more than ten years, offering her expert knowledge across various publication and brands, as well as styling a whole host of high profile celebrities. 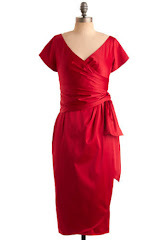 The partnership sees her offer advice on what to wear this holiday season; highlighting a number of key looks to help you look perfect no matter where you’re going, or what swimwear you choose. She’ll be assisting customers through the use of her ’60 second swimwear fix’ (available on the Swimwear365 YouTube channel), where she’ll highlight how you can dress perfectly for your shape while on holiday. It doesn’t matter whether you have an apple, hourglass, pear, rectangle or top heavy body shape, Helen will ensure you’ll feel confident and look fabulous on holiday. 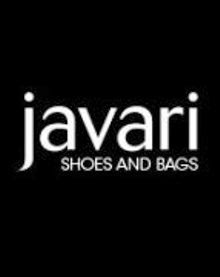 Swimwear365 is the UK’s largest online swimwear retailer and stocks brands exclusive to the UK including S.Oliver, LASCANA and Buffalo, along with renowned brands such as French Connection, Adidas, Panache Swimwear, Marie Claire and many more. 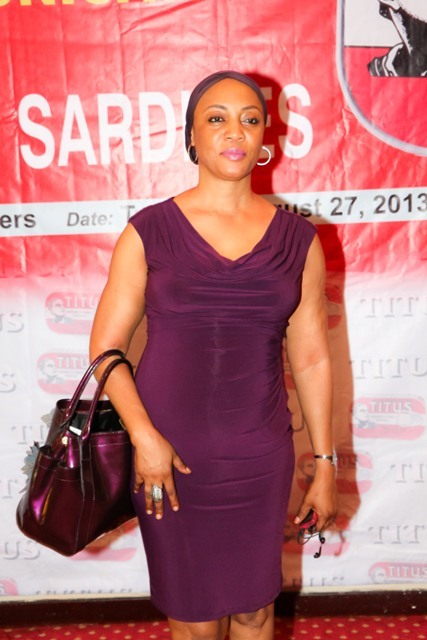 Another Nollywood diva, Ibinabo Fiberesima, the first female President of the Actors Guild of Nigeria (AGN) has joined African Movie Academy Award for Best Actress, "The Face of Onga" and brand ambassador for Samsung West Africa Kate Henshaw and other VIPs who will co-host the Nigerian premiere of the CNN film "Girl Rising" on Friday October 11, 2013, at the Silvebird Cinemas to celebrate the United Nations International Day of the Girl Child. The event has attracted the cooperation and support of several important people and organizations including Zonta International in Nigeria, United Nations Information Center, Kiddies and Brands Company, dobox, Nigeria's leading entertainment on-demand (EOD) portal, International Digital Post Network Limited, publishers of Nigerians Report Online, Nollywood Mirror, and others. 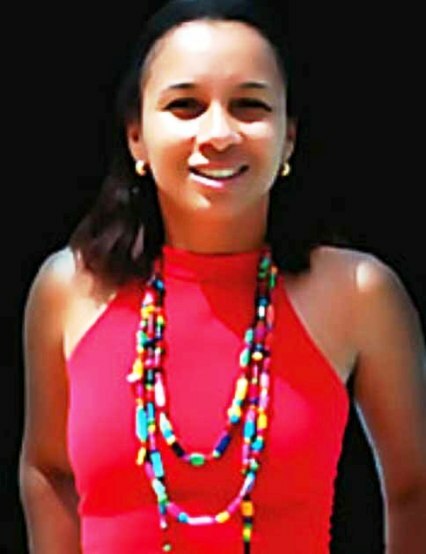 Arise and shine my beloved Nkiruka. Don’t ever give up and don’t lose hope. ~ By Ekenyerengozi Michael Chima, Thursday August 29, 2013. I composed this song as an inspiration and motivation for every female child in the world, and especially for the Girl Rising Campaign of 10x10, to educate and empower girls to overcome the challenges of their circumstances and succeed in life. 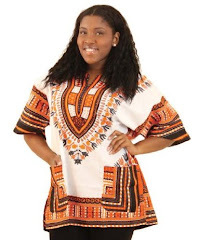 Nkiruka is an Igbo word meaning the future is greater and it is a popular Igbo name for girls in Eastern Nigeria. 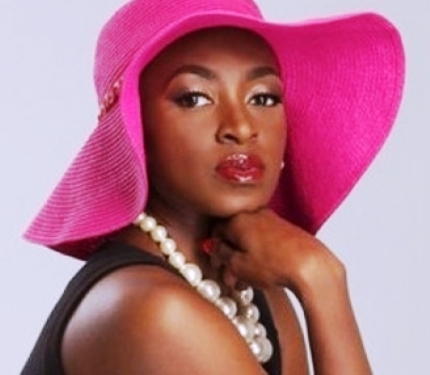 Kate Henshaw To Co-host Nigerian Premiere of "Girl Rising"
Kate Henshaw, the famous Nollywood diva will bring her star power to the Nigerian premiere of groundbreaking CNN film Girl Rising, on Friday October 11, 2013, to celebrate the International Day of the Girl Child at the Silverbird Cinemas, Silverbird Galleria on Victoria Island, Lagos. Kate Henshaw will co-host the premiere of "Girl Rising" featuring Hollywood stars Freida Pinto, Anne Hathaway, Selena Gomez, Alicia Keys, Meryl Streep, Salma Hyak, Cate Blanchett, Kerry Washington, Priyanka Chopra, Chloe Moretz, and Liam Neeson who narrated this must see film. 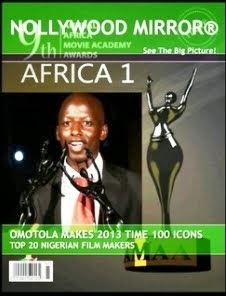 The Nigerian premiere has attracted both local and international partners and supporters, including Zonta International, United Nations Information Center, Nigerians Report Online, Kiddies and Brands Company, Dobox TV and others. “No one is more vulnerable than an uneducated girl,” said Freida Pinto. "And this film is a wake-up call to world that it’s time to educate girls". Many who have watched the film in the U.S. got tears from the nine survival stories of girls in developing nations. Wadley in Haiti who seeks an education after the powerful earthquake, Ruksana who lives on the side of the street in India, and women in Afghanistan who get married at 11 years old. Each girl was paired with a renowned writer from her native country, and the stories show how education can change lives forever. 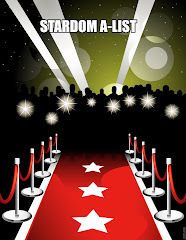 Directed by Academy Award-Nominee Director Richard E Robbins with original music is by Academy Award winner Rachel Portman in collaboration with Hans Zimmer, and other notable women supporting "Girl Rising". “We had a woman DP behind the camera, we had a woman composer writing music, we had women designers doing visual effects, we had a woman editor, a woman producer – we really went out of our way as much as possible to practice what we preach and say let’s put women in power positions in all aspects of this project. 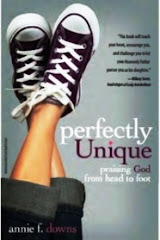 With the exception of me, and a couple of other men, we were definitely a powered by women brigade,” said Richard. The "Girl Rising" produced by 10x10 is more than a film as it is part of a global campaign to educate and empower girls. “Our vision is to connect every person on earth so when you think about that, with millions of girls who don’t have access to education, we can’t achieve our vision. Even beyond that piece, it just really began to bother us that girls were being left behind, which meant their families were being left behind, their communities were being left behind and we are a global company of global citizens – and what happens to a girl in Peru, in Haiti impacts girls here in the United States," said Rosalind Hudnell, Chief Diversity Officer, Global Director of Education & External Relations at Intel Corporation, one of the co-sponsors of "Girl Rising". “Girl Rising” has sold over 125,000 tickets in the U.S alone. There is no living soul that is never angry, but only the wise one controls the anger. And does more harm than good. More precious things have been destroyed and lost than gained in anger. 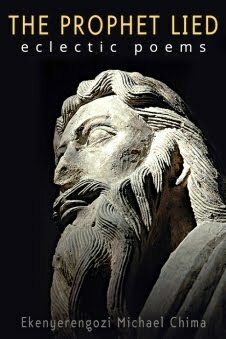 I am not saying you should not be angry, but only a fool is angry at being told the bitter truth. If someone tells you the truth and you are annoyed, then you are evil. Because the one who tells you the truth is better than the evil one who lies to you. You can know a good person by how the person reacts to truth. If the person accepts it with humility and makes a positive change, then that person is a good and wise person. But if the person reacts negatively, that person without doubt is a bad and evil person. Be angry at what it bad and not at the truth. As God said, only the truth shall set you free and not lies. Even if you are angry, don't chain your heart to it until it tears it apart. When you drag your anger for long, it becomes a shadow of sorrow. 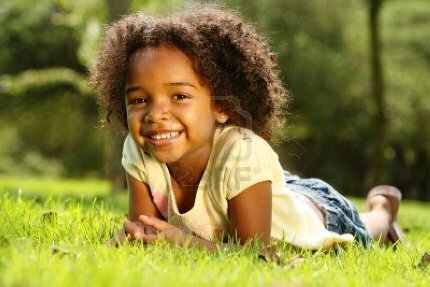 Therefore, I advise you to let your anger be like when you cough that does not last longer than when you laugh. Let me warn you that, it is a waste of time to pray to God until you repent of your anger against someone who has done nothing wrong but tell you the truth. Call a spade a spade even if it hits you in the face than call it something else until it kills someone. Finally, remember the following warning about anger. 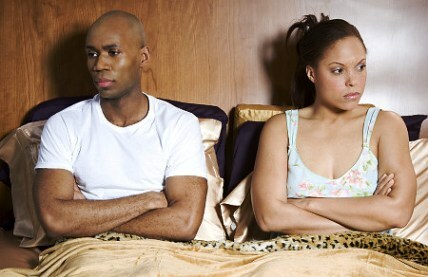 When you are angry with your lover or spouse in the house, throw harmless pillows and not blows. Kisses make us beautiful, but bruises make us ugly. So, do what will make you more beautiful. ~ By Orikinla Osinachi, prize winning Nigerian writer, author of Children of Heaven, Scarlet Tears of London, Language of True Love, Bye, Bye Mugabe, In the House of Dogs, Diary of the Memory Keeper, The Prophet Lied and other books. 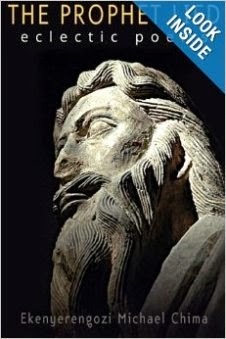 You can find the books by the author on Amazon. 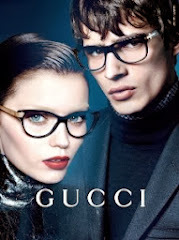 They are hot and this is without hyperbole. They are really hot and I can say hotter than summer. 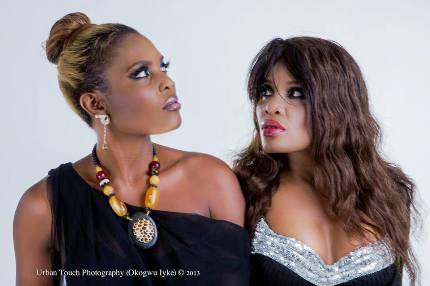 They are D'Adshas, two lovely sisters born and raised in Calabar, Deo Kiki and Shosho Kiki. AUSTIN, Texas, Aug. 26, 2013 /PRNewswire/ -- By purchasing any of five ONEHOPE or Santa Rita Organic wines this fall, shoppers can help create new beginnings for people in the U.S. and developing countries. 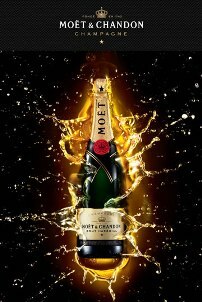 A portion of the proceeds from the wines will be donated to Whole Planet Foundation to fund poverty alleviation around the globe. For every bottle of ONEHOPE Chardonnay or Cabernet Sauvignon sold in September and October, 50 cents ($6 per case) will be donated to Whole Planet Foundation. For every bottle of Santa Rita Organic Sauvignon Blanc, Carmenere or Cabernet Sauvignon sold, 25 cents ($3 per case) will be donated to the foundation. "We are honored to partner with Whole Planet Foundation to raise funds to alleviate poverty and fund almost 200 new loans to micro-entrepreneurs all over the world," said Jake Kloberdanz, CEO of ONEHOPE. ONEHOPE Chardonnay, California—vibrant flavors of crisp pear and apple please the palate. ONEHOPE Cabernet Sauvignon, California— shades of ruby red compliment the aromas of lush black cherries, cassis and hints of tobacco. Santa Rita Organic Sauvignon Blanc, Chile—zesty flavors of grapefruit and lemon peel mingle with tropical fruit and herbaceous notes. Santa Rita Organic Cabernet Sauvignon, Chile—intense flavors of ripe black fruit with notes of black pepper and exotic spices lead to a lingering finish. Santa Rita Organic Carmenere, Chile—a versatile wine with a bouquet of ripe black fruits topped with chocolate and vanilla notes. Founded in 2005, Whole Planet Foundation's mission is to empower women entrepreneurs with microcredit and the chance to create or expand a home-based business and lift themselves and their families out of poverty. Through grants to microfinance institutions in 57 countries (the U.S., and in 56 countries across Asia, Africa and Latin America), the foundation currently supports more than 282,000 clients, with a repayment rate of 96 percent. Who Will Win the $100,000 Prize for Literature?